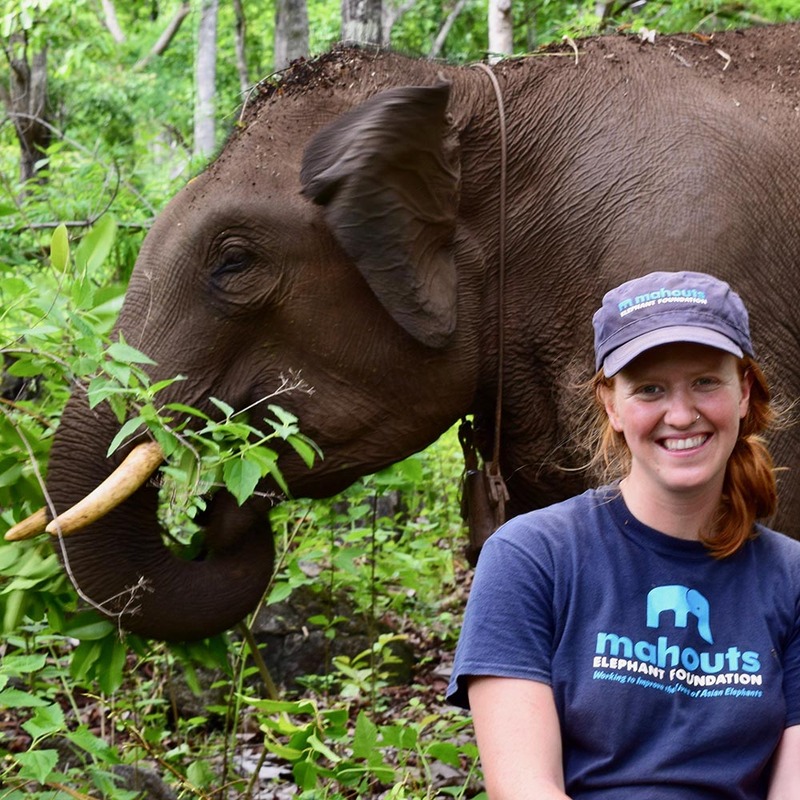 Rebecca Winkler ’16 writes about her experience working with the Mahouts Elephant Foundation in the latest issue of Wesleyan magazine (“Letter Home” page 68). Here, she introduces us to four elephants she has come to think of as part of her family in the Karen hill tribe in Thailand, where she lives. All of our elephants have completely different personalities. 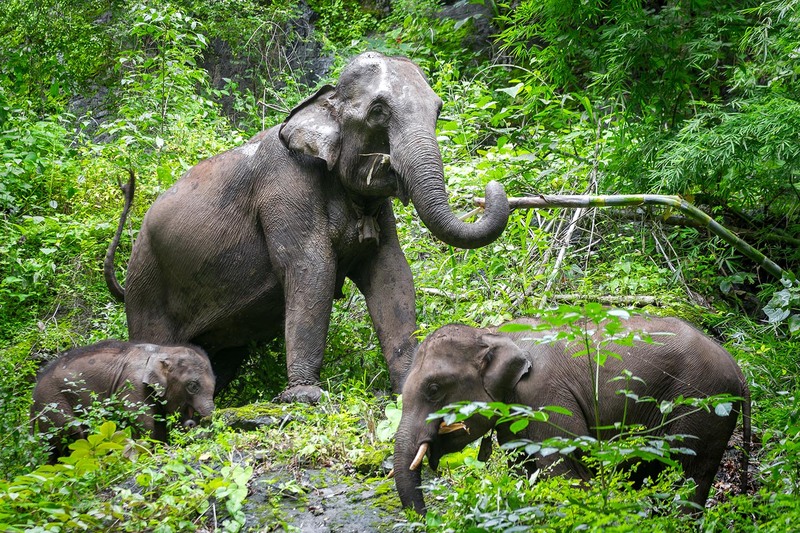 Thong Kam is 30 years old and our matriarch (center, above). She’s had a difficult life, spending about a decade in an elephant riding camp, forced to perform tricks and give rides to tourists. She lost her first calf to a stomach virus common to elephants forced to live in close quarters without adequate diets. You would never guess her sorrowful past, though, when you see her now. She leads her family through the forest with confidence, just like any wild matriarch. 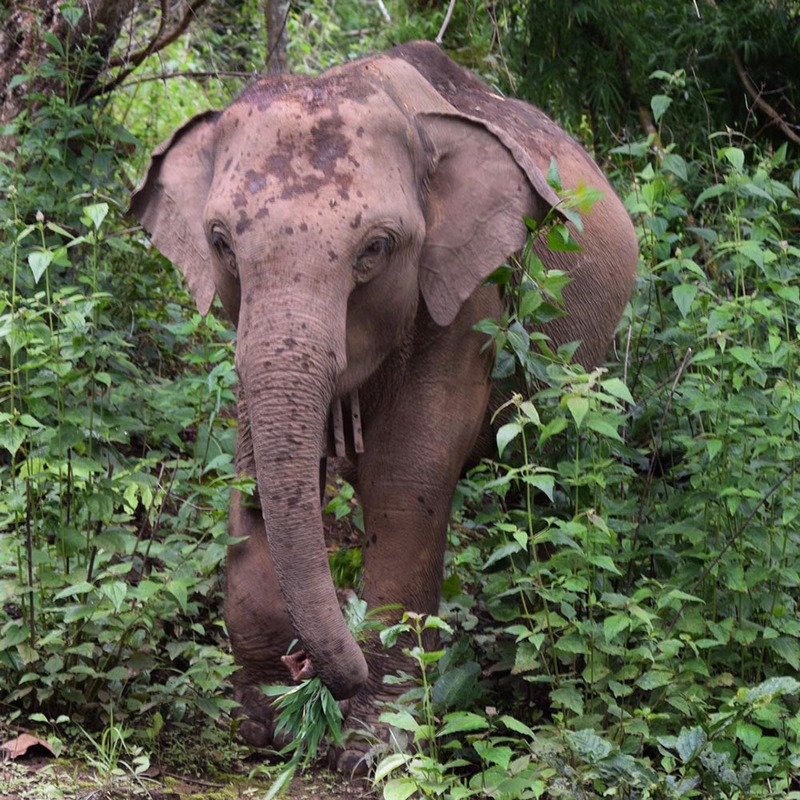 Her second calf is Bai Fern (below), and Thong Kam recently gave birth to her third calf, Sunti (left, above), in the middle of the night in the forest with no humans around. In elephant camps, babies are kept in small enclosures, with people watching them every minute. Living in the forest, Sunti was climbing up mountains at two weeks old. He’s growing rapidly, learning all the skills of a calf in the wild, and I expect he will be the most well-adjusted of all of our elephants as he ages. I’m proudest of our young female, Bai Fern, age 5 (right). She was born in an elephant camp, and until she returned home two years ago, she had never been exposed to life in a forest. She had only eaten corn and elephant grass that humans brought to her, and she had been surrounded by people all the time. She has adapted well to life in the forest and she is incredibly confident, often straying hundreds of feet away from her mom. She’s had more than her fair share of personal hardships, including one that many humans can understand: the birth of a new baby brother who took away her mom’s attention. At first, Bai Fern was furious at little Sunti for being able to nurse when she couldn’t, and for always staying so close to Thong. But like most older siblings, Bai Fern grew out of it and is now very protective of Sunti—like a little mother. When guests come and Sunti is curious about them, she will often stop him before he heads toward the new people, as if to say, “You have to know better than to approach strangers!” She is completely comfortable with the mahouts and me, though, and even turns her back when Sunti approaches, knowing he’s always safe with us. Mario, age 7 (left, with Winkler) is unique. His mother ran out of milk when she was breastfeeding him, and it’s a miracle he survived. He seems to be developmentally delayed, both physically and mentally. This leaves him in an interesting position, as he’s a big tusker with a personality more similar to Sunti’s than to an adult elephant. Manit, our head mahout [traditional elephant keeper] has been with Mario since he was born, though, and knows all of his quirks and eccentricities and how to handle them. Mario clearly sees Manit as a family member. He is easily spooked and often runs to Manit, rather than the other elephants, for comfort. Mario was never sent to work in an elephant camp; the village knew he would never survive it. However, the early years he spent as a solitary elephant—before he was joined by Thong Kam, Bai Fern and Sunti—likely put a lot of strain on him. He has a harder time than the other elephants in dealing with the day-to-day challenges of life in the forest, often stereotyping (swaying back and forth) while he tries to make his own decisions. With the help of his fellow elephants and the mahouts watching carefully, he’s improving a lot. He’s getting much stronger and is able to pull down a lot of his own bamboo and find his own food. He’s also playing more with Bai Fern and Sunti, rather than the mahouts. Rebecca Winkler ’16, began working with the Mahouts Elephant Foundation through her Feminist, Gender and Sexuality Studies thesis project, Walking with Giants: Ecofeminist Insights on the Tourism Industry in Thailand. The foundation’s Walking with Elephants project provides income to Karen hill tribe villages in Thailand and allows their elephants to return to their natural habitat. Additionally, the project also serves as a research hub to study Asian elephants in their natural habitat and the ways the village coexists with them. Winkler, now project manager for Walking with Elephants, enjoys a unique perspective into the daily life of these huge animals and the tribe that depends on them—and protects them.